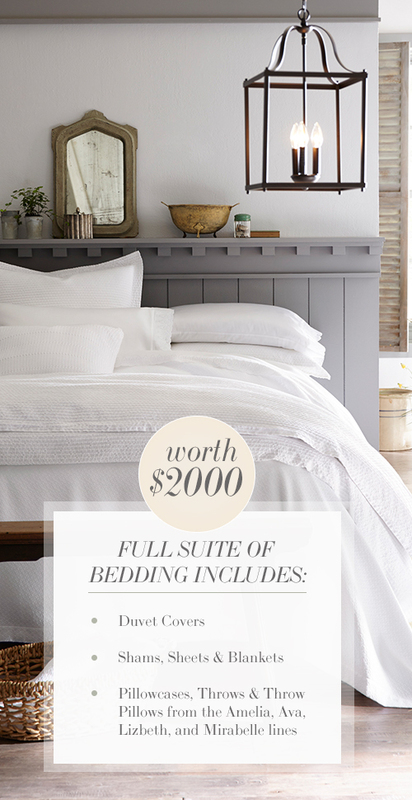 Veranda Magazine wants you to enter once for a chance to win a luxury Queen Size bedding set from Peackock Alley worth over $2000! One (1) winner will receive a Peacock Alley Queen Bedding Set which includes Lizbeth Duvet Cover, ARV: $550; Lizbeth Shams, ARV: $135; Ava Flat Sheet, ARV: $205; Ava Fitted Sheet, ARV: $170; Ava Pillow Cases, ARV: $115; Amelia Blanket, ARV: $370; Mirabelle Throw, ARV: $215; Mirabelle Pillow, ARV: $160; Total ARV: $2,055. HINT: Be careful not to subscribe unless you want to! This Sweepstakes ends on 08/29/16 and you can ENTER ONCE to win.